Well, for just $45,000 (with no reserve price) it seems I could buy the world's largest collection devoted to any one fruit, according to the Guinness Book of World Records (1995 Golden Anniversary Edition). 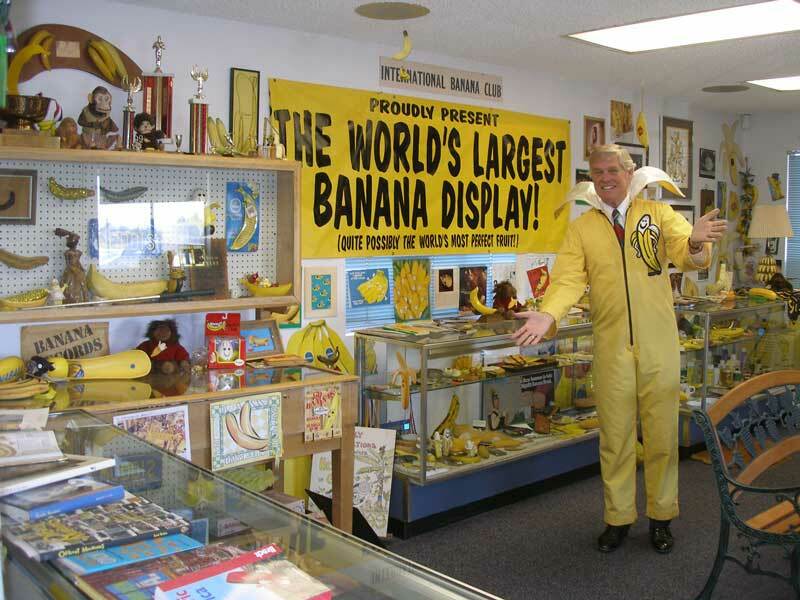 The International Banana Club Museum, founded by Ken Bannister, is for sale on eBay until Apr 07, 2010 at 17:48:57 PDT. Nine days left! Apparently, the founder has reduced the price to $15,000 in hopes of finding a buyer. A Wall Street Journal article dated March 23, 2010 reports the International Banana Club Museum was established in 1972, when it started with 10,000 Chiquita banana stickers before well-meaning banana merchandise filled a museum in Altadena, CA. Later, in 2005, the collection moved to its current location in Hesperia, CA. Now the Hesperia Recreation & Parks District (north of Los Angeles) wants the banana museum to go. The Park District has not been charging Bannister rent for the past 5 years since they were not using the space, but now it wants to rotate exhibits. So, out with the bananas and in with "artifacts collected by the late John Swisher, a local historian." Membership to the club is a flat rate of $15 and, just like Bananaster, members can come up with their own nickname. Additionally, members can climb up in social ranks; the more banana-phernalia one donates, the higher the "B.M." (banana merit) they are rewarded, such as PHB, Doctorate of Bananistry Degree. Banana Club members are said to get extra discounts when presenting their Banana Card Clubs in public, though a simple smile is what the club strives for. And if the smile isn't enough, members can also brag about their fellow famous Banana Club-ers: Jay Leno and former US President, Ronald Reagan. Want to learn more? Visit the International Banana Club Museum official website. UPDATE (April 12, 2010): The Banana Museum is saved! Read about Fred Garbutt, 46, and his mother, Virginia, who purchased the banana collection. The saved banana museum is set to open in January of 2011 in North Shore, CA. By the way, Fred has 110 of converse gym shoes... but no yellow ones!